Alfred A. Knopf / G.P. Putnam's Sons / William B. Ewert / Orchard Books, 1972. First Edition. Hard Cover. Near Fine/Near Fine. Signed by author. First editions. 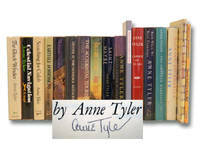 Each (except Digging to America) signed without inscription by author on title page. The Clock Winder: board edges a bit faded, two tiny spots on top page ridge. Back When We Were Grownups includes publisher's newsletter (laid in).